The Bamburgh Research Project is working with the local community and universities to investigate a truly remarkable ancient wetland site, located just a few mile from Bamburgh, near the village of Lucker in Northumberland. The project explores the wetland area around Newham Bog, close to Bradford Kaims, in north Northumberland. We started work there in 2009, when peat deposits in the region of Hoppen Hall Farm were identified during a test-pitting project. Initially we also undertook limited test-pitting but our research was greatly advanced by grants from English Heritage and the Heritage Lottery Fund. The Heritage Lottery Fund awarded a grant of £35,300, towards the project through it’s Your Heritage scheme, which together with more than £13,000 from English Heritage, has enabled a programme of community archaeology activities, exploring the ancient wetland to be undertaken. Volunteers have worked with our archaeological team to locate and excavate archaeological sites and to learn media skills to enable them to put their experiences online. Lectures and seminars given locally are also available online (youtube) to share the project’s discoveries with a wider audience. The results of the research will be made available to local schools as a teaching aid, so that future generations of children can also explore this fascinating historic landscape. In 2010, we began to explore the archaeological potential of an ancient wetland, now pasture prone to flooding, but in earlier times a peat filled former lake. The wetland is located near the village of Lucker in North Northumberland, only a few miles from Bamburgh Castle. The surviving part of the wetland site was first investigated by Dr Bartley in 1966, who cored up to 10m deep into the peat bog, and more recently by Dr Ian Boomer, of Birmingham University, and Dr Richard Tipping, of Stirling University, working with the Bamburgh Research Project. Peat is interesting as it has the wonderful property of preserving the kind of organic remains, such as wood and other plant remains, that do not survive on dry sites. Preserved pollen is particularly informative as it allows us to identify the kind of plants that once grew in the vicinity of, and on, the bog. Deep cores lifted from the accumulated peat and lake sediment allow us to develop a model of the changing environment in this corner of North Northumberland extending back thousands of years. As archaeologist we do like to plan our work, but luck sometimes plays it part. On the Bradford Kaims Project we first undertook test-pitting around the contour level, where we believed the ancient dry land would have met with reed swamp, or even open water. We assumed that this would be a popular area for human activity, allowing as it would access to dry land and wetland resources. In short a good place for hunter gatherers to find game. Finding the lake margin is quite easy. A line of test pits, running down-slope will show you when the dry subsoil beneath the topsoil gives way to thin layers of peat, above the subsoil. As part of this test-pitting investigation we were delighted, and lucky, to find actual features relating to ancient human activity. The first of these was an unusual layer of stony burned material, which was soon found to overly large stone slabs, that proved to be a hearth-like structure. Much more extensive investigation between 2011 and 2012 revealed this burnt layer to the first burnt of a series of burnt mounds. 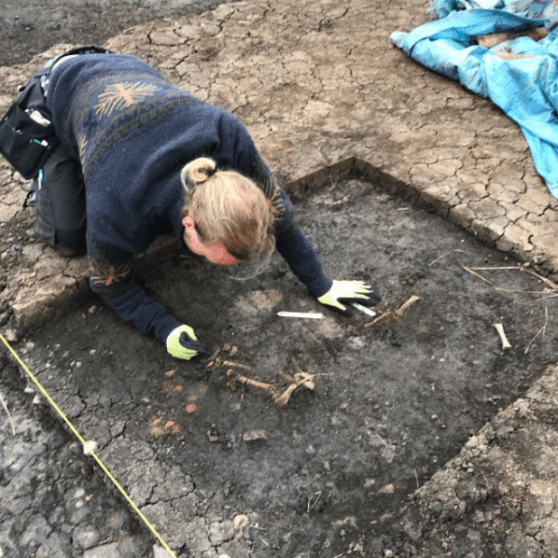 The hearth-like structure (after some time and much thought, this is still our best interpretation) was dated for us by Sam Harris of Bradford University, using archaeomagnetic dating. The date he came up with for its last heating episode was 4230 BC (with dates between 4468 BC and 3995 BC at 95% confidence). This made the hearth, and the mound, very early indeed. Dating back to the period when hunting and gathering was giving way to farming within the UK. This is unusual as such burnt mounds tend to be thought of more as Bronze Age features. There are some very early ones, of similar date to ours, but such a date remains unusual so we will be doing some carbon dates to confirm it. The mound with its hearth became our first proper excavation, and has been expanded over the last few years to an open area trench. During this time it has become apparent that what appeared to be a single large mound, is in fact composed of a series of smaller, though still substantial mounds, each some metres across and several tens of centimetres thick. This series of smaller mounds extends beyond our trench to the north-west and south-east, parallel to the former lake, making it more than 13m across. It also extends up-slope for at least 8m. We are certain we have five phases of mound, there may prove to be more. They are separated by thin layers of clay, probably washed down the slope of the hill or laid by flooding events. The Kaims area is certainly an environmentally dynamic environment. Watch our video for a general introduction to the site. Our survey to map the extent of the former lake has shown us that the landscape at the base of Hoppenwood Bank is quite a complex one. Our topographic work, together with the test-pitting and coring, has helped us build up a model of the area, both on the surface and beneath the surface. One of our discoveries has been the identification of a narrow promontory that extends southwards from the base of Hoppenwood Bank. This divides what we thought of as a single peat filled lake into two basins. This, as our expert Dr Richard Tipping, has explained to us, is interesting because it means the we have two basins close together that appear to have had different environmental histories. This complicates things, but also means we have a more interesting story to tell. Click on the image below to see the topographic survey of the site area. We were helped enormously by Horizon Aerial Photography, who are an Alnwick based company that specialises in low level aerial photography using remote controlled drones. Their visits to site have provided us with some stunning images of the site area (nice photo). We have also been fortunate to have had some geophysical survey donated to the project by Geophysical Services of Bradford (who many of you will recognise from Channel 4’s Time Team), who were able to survey much of the promontory area south of the modern fence line. They pinpointed several anomalies that could be the result of ancient human activity, and we were able to test a number of these during our excavations during 2012 and 2013. One anomaly stood out though, as it was both a strong return and a large one. Of a similar size to the burnt mound, identified by excavation to the north of the fence, it indeed turned out to be a second burnt mound. The second mound was investigated in 2012. Initially by a linear trench that measured 10m by 2m, but this was soon augmented by an adjacent trench once the scale of the mound had been revealed. As with the first mound, it comprised imported dolerite, sandstone and ironstone fragments, many of which showed signs of having been fire-affected, which clearly identified it as a second burnt mound. The mound known to be at least 6m in diameter was not intrusively excavated, so its depth is not known yet. In the centre of the mound a sandstone slab set on edge was located. 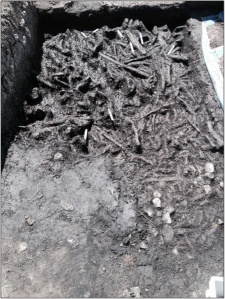 Investigation revealed that it formed the head of a trough, filled by a succession of silt-rich soils containing a high proportion of charcoal. This kind of feature is commonly associated with burnt mounds of early Bronze Age date, which is interesting as the limited finds from this mound point to it being of bronze Age date. Our latest information, based on our test-pitting programme and the use of a penetrometer (a far from sophisticated technique of probing the ground with a narrow steel spike) has revealed that the two mounds are not alone. In fact we believe we have identified at least 12 mounds in the immediate vicinity alone. The highest concentration of such features in Northumberland. The dry summer of 2013 substantially lowered the water table, compared to that of the previous two seasons, and this allowed a much more extensive investigation below the dry land margin and into the peat basin itself than we had been able to undertake previously. This lowering of the water table allowed the extension of our Burnt Mound 1 excavation trench, south-westwards into the wetland area, resulting in the exciting discovery of an extensive timber platform, formed from round-wood branches pegged into the upper peat layers. A Mesolithic platform of this type, found at Eskmeals in Cumbria by Clive Bonsall, has been interpreted as an attempt to stabilise the ground. Our platform could have been constructed for similar reasons, but it is also possible that it could have been intended as an access-way to open water, within the lake system itself. Whatever its function it is clear that the platform is substantial, as we have traced it for 11m by 9m and have yet to find its full extent, either along the former edge of the lake, or how far it extends into the lake. We do know that it overlies the most extensive of the burnt mounds and is covered by at least one later period of mound deposition, making it broadly contemporary to the period of mound formation. This later phase of mound accumulation has been dated by an archaeomagnetic date and also provisionally from the identification of a number of sherds of pottery, thought to be Carinated Bowl. If correct the dating evidence would mean our platform, like the mound, dated back to the very early Neolithic. It is on the surface of the round-wood platform that the most exciting find of the 2013 season was discovered. A timber paddle, preserved by the peat layers, lay, slightly pressed into the surface of the platform, in the south-east corner of the trench, immediately to the south-west of a modern double field drain, that had just missed it. Its preservation was in fact doubly lucky as had it lain only centimetres higher it would have been above the anaerobic horizon and have decomposed long ago. The paddle was mostly intact, though the tip of its handle may have been detached and laid next to it. It is asymmetrical in shape, with the handle an extension of one side of the blade. This asymmetric form is unusual for a boat or canoe paddle, which has led to the speculation, that it could be one of a pair used for picking up the heated stones of the mound. Although most investigations of cultures that use such technology suggest the use of split branches to pick up the stones. The paddle was lifted as a block and taken to Edinburgh University, in the hope that it could be preserved, but sadly the find proved too thin and fragile to be successfully lifted and excavated. We will still be able to investigate the fragments in order to identify the species of wood, from which it was made, and also to see if we can identify tool marks from its manufacture. The coring programme undertaken in the summer of 2014, led by Dr Richard Tipping, concentrated on the investigation of the area of the Wishaw Burn to the south-west of Trench 6. The intent was to investigate the extent of the timber platform, identified within the trench and to gain an understanding of the sediment sequence within the narrow channel, that today contains the burn. The investigation revealed the profile of the burn and showed how the side of the channel, and the water flow rates, have changed over time. Fascinatingly it was also able to identify multiple phases of timber platform, built up over a depth of 1.6m. This exciting result shows us that the platform was not an isolated single event, but a long lived and extensive structure. We look forward to future seasons of work when we hope to further investigate it, in order to better understand both its manufacture and its function. The most unusual features revealed during the dry summer of 2013 are a further series of stone mounds, but in this case they were not burnt mounds, but more straightforward mounds of stone. We identified a series of them by investigating shallow lumps and bumps within the former wetland itself. We dug a test-pit that measured, 2.4m south-west to north-east and 1.6m north-west to south-east, into one of them and found that extended beyond the limit of excavation in all directions. The stone heap was composed of irregular sandstone fragments of small to large size that had been stacked 0.6m thick on a round-wood timber raft, laid directly on the upper peat horizon. These mounds appear to be in a line, extending into the wetland, and we do have limited evidence to suggest that they are connected by a brushwood track-way. The extent of the mound alignment has yet to be identified, but certainly extends for some tens of metres and comprises at least a further three mounds. As of yet we have no archaeological dating evidence for these strange features, but the lack of finds, and their form, makes us suspicious that they could be of relatively early date.